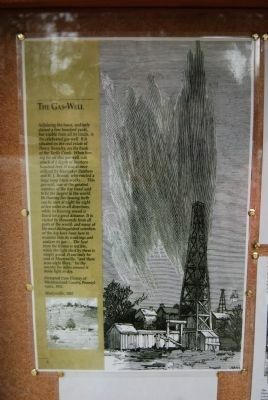 On this site, a pioneer natural gas well "blew in" on November 3, 1878. 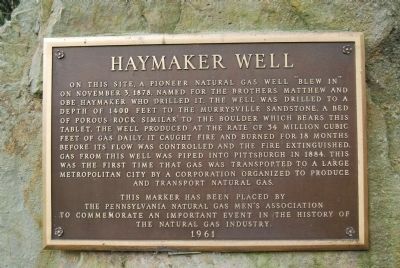 Named for the brothers Matthew and Obe Haymaker who drilled it, the well was drilled to a depth of 1,400 feet to the Murrysville sandstone, a bed of pourous rock similar to the boulder which bears this tablet. The well produced at the rate of 34 million cubic of gas daily. It caught fire and burned for 18 months before its flow was controlled and the fire extinguished. 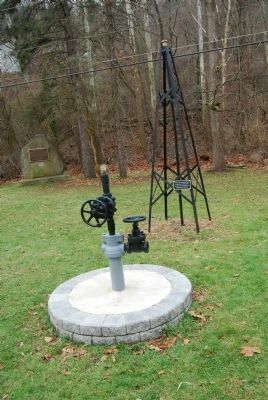 Gas from this well was piped into Pittsburgh in 1884. This was the first time that gas was transported to a large metropolitan city by a corporation organized to produce and transport natural gas. 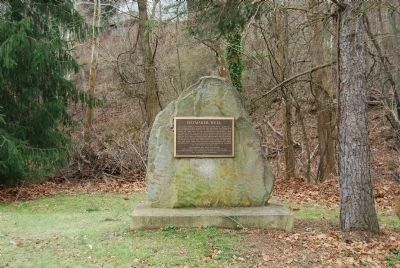 This marker has been placed by the Pennsylvania Natural Gas Men's Association to commemorate an important event in the history of the natural gas industry. Erected 1961 by The Pennsylvania Natural Gas Men's Association. Carson Avenue. Touch for map. Marker is in this post office area: Murrysville PA 15668, United States of America. Touch for directions. Other nearby markers. At least 8 other markers are within 6 miles of this marker, measured as the crow flies. 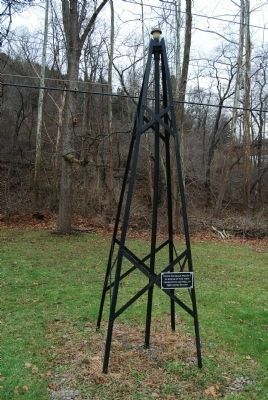 Murrysville Gas Well (about 700 feet away, measured in a direct line); Forbes Road (approx. 1.2 miles away); a different marker also named Forbes Road (approx. 1.8 miles away); William D. Boyce (approx. 3.6 miles away); a different marker also named Forbes Road (approx. 3.8 miles away); Pontiac's War (approx. 5.9 miles away); Welcome to Bushy Run Battlefield (approx. 6 miles away); Ambush (approx. 6 miles away). 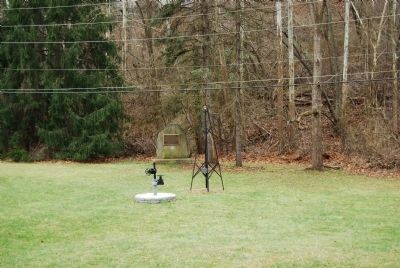 Touch for a list and map of all markers in Murrysville. 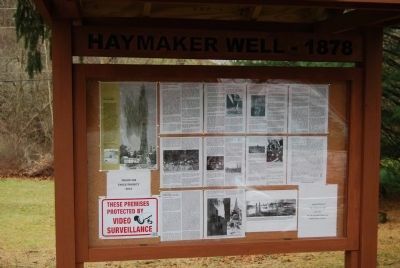 Display contains information and items regarding the Haymaker Well as well as other information on gas production in Murrysville. Adjoining the town, and only distant a few hundred yards, but visible from all its limits, is the celebrated gas-well. It is situated on the real estate of Henry Remaley, on the bank of the Turtle Creek. When boring for oil this gas-well was struck at a depth of fourteen hundred feet. It was at once utilized by Haymaker Brothers and H.J. Brunot, who erected a large, lamp-black works...This gas-well, one of the greatest wonders of the day (was) said to be the largest in the world. Its flaming fire issuing forth can be seen for eight or ten miles in all directions, while its buzzing sound is heard for a great distance. It is visited by thousands from all parts of the world, and many of the most distinguished scientists of the day have been here to examine into its workings and analyze its gas...The heat from the flames is terrible, while the light shed by them is simply grand. It can truly be said of Murrysville, "and there is no night there," for the country for miles around is made light as day. More. Search the internet for Haymaker Well. Credits. This page was last revised on June 16, 2016. This page originally submitted on November 30, 2014, by Mike Wintermantel of Pittsburgh, Pennsylvania. This page has been viewed 354 times since then and 13 times this year. Photos: 1, 2, 3, 4, 5, 6, 7. submitted on November 30, 2014, by Mike Wintermantel of Pittsburgh, Pennsylvania.